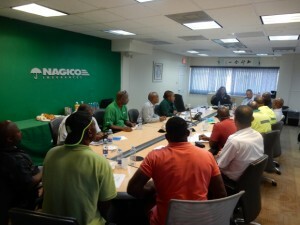 WILLEMSTAD - The 5th edition of the NAGICO to NAGICO cycling competition will kick off this Friday; May 19 at the Simpson Bay Causeway Bridge and the headline sponsors; NAGICO Insurances are in full gear as they count down to the event. A brief Opening Ceremony on the Simpson Causeway Bridge on Friday May 19, starting at 6:30pm and the Time Trial Race in which the riders will compete against each other from 7.00 – 9.30pm. On Saturday May 20th beginning at 8:30am in front of Tackling Insurances on the French Side with riders doing several laps across the Oyster Pond Border- Casa Blanca / Bishop Hill Road -Tata Round, Dutch Quarter to French Border (7 laps). On Sunday, the race will culminate on Sunday May 21st, at 8.30am beginning from NAGICO Head Office on the Dutch Side to the NAGICO Branch Office on the French Side. Over the years, the race which happens over a span of 3 days, has attracted scores of patrons from both sides of the island and continues to grow in capacity and as a result, security and safety planning and awareness have also increased. In a recent planning meeting, members of the Police/ Traffic, Ambulance, Red Cross, Coast Guard and SLAC sat with the stakeholders to outline a plan of action which will ensure the safety of the riders, patrons and road users. “We have to take every precaution necessary, because all it takes is one mishap, so we have to always err on the side of caution,” Chief Inspector Benjamin Gout said to the group. The NAGICO to NAGICO Cycling Race is a free event and all are invited to come out and experience the fun with the NAGICO team.